Randa greetings from the VDG - Hahmulookin? The Randa Meetings are happening now in the Swiss Alps. More than 50 people are giving their time to improve KDE software and innovate new value for users. 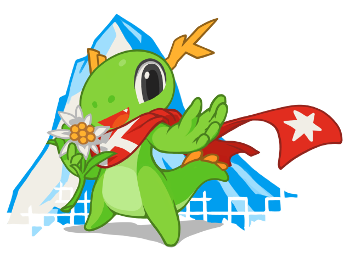 The theme of this sixth edition of the Randa Meetings is Bring Touch to KDE, and the KDE Visual Design Group (VDG) is making their contributions to the look and feel of KDE technology. Visual appearance has been a primary consideration for KDE from the beginning—"users [should be able to] expect things to look, feel, and work consistently". The Visual Design Group is responsible for the User Experience, Usability, Design, Look and Feel of KDE software. The VDG has been working from a TODO list at the Randa Meetings. There has been good progress and still things the VDG wants to accomplish in Randa. This is planned for Plasma release 5.4.2 in October. The icons are mostly done; for example, device icons are now 80% covered. Together the groups decided how Plasma and applications should look and feel on mobile devices. The two teams addressed hot topics such as the behavior and results of swipe action from the edges, navigation in applications and application layout in general. Human Interface Guidelines for mobile applications will be available soon, so that developers can start porting their applications to Plasma Mobile. The discussions about the look and feel of sidebars lead to the results described in a blogpost by members of the VDG. As a part of the ongoing work of streamlining system settings, the KCM for Desktop Search was reworked. See screenshot below. These fixes will be available in Plasma release 5.4.2 (October). 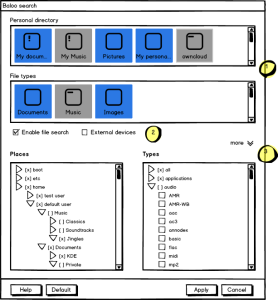 A couple of applications have hard-coded icons that do not respect the user's choice or do not reflect the current state of the Breeze and Breeze Dark supported icon themes. Some applications either lack appropriate Breeze icons or the developers are not sure which icons are the best to use. Working closely together helps both the VDG and developers to know how to offer a good set of icons that look nice, fit well and are easy for users to understand. Many users prefer the Oxygen icon theme. However, it had not been maintained for a while and is not officially supported. This will be changed as Oxygen will now be maintained as an additional choice (though not extended or further developed), along with Breeze and Breeze Dark. Users will be able to switch between any of the three icon themes with a simple click. The Visual Design Group is very happy to be in Randa, where they have a full week to work together, and are able to have intense discussions about design and code with application developers. There has already been a lot of progress in a small amount of time. In addition, some issues that came up during the sprint were resolved, such as KDE software on Windows and Android application developers concerned with the size of icon packages that have to be provided along with the applications. Developers, interested people or KDE software users are invited to participate in the Visual Design discussions. This is an important aspect of KDE technology. Please contact the VDG on their forum. The Visual Design Group is planning to have a Design Sprint in 2016. Money raised in the current fundraising campaign will be used to cover that sprint and others. KDE sprints have the primary objective of providing value to users of KDE software. So please consider donating to the Sprint Fundraising Campaign. WHat this means: Randa greetings from the VDG - Hahmulookin? Hahmulookin > How am I looking? What do you think of my new hat? or shoes? or skateboard? or skateboard trick? In this story ... What do you think of the work of the Visual Design Group? I've been using the Breeze theme for several months. It is useful and doesn't get in the way. Looking good. What do you think of the KDE look? 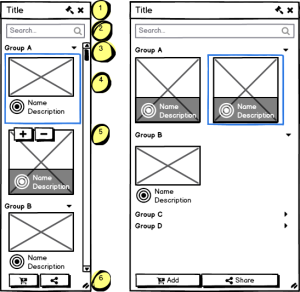 What app are you using for those mockups? This is all very awesome to hear! Great work! A quick question about theme settings. Currently, to switch from one theme to another, I need to change settings in 3 different UI dialogs (desktop theme, color and icons). Am I doing something wrong ? If I'm not, is there any plan to change this behaviour ? I mean, from a user perspective, it would make more sense to have a single theme dialog to switch theme in one go. P.S. It seems that will need to do a backup of /usr/share/icons too.